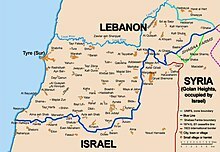 The 1978 South Lebanon conflict (code-named Operation Litani by Israel) was an invasion of Lebanon up to the Litani River, carried out by the Israel Defense Forces in 1978 in response to the Coastal Road massacre. The conflict resulted in the deaths of 1,100–2,000 Lebanese and Palestinians, 20 Israelis, the internal displacement of 100,000 to 250,000 people in Lebanon, and the PLO forces retreating north of the Litani River. It led to the creation of the UNIFIL peacekeeping force and an almost complete Israeli withdrawal. Though it took the form of an Israeli military incursion into Southern Lebanon, Operation Litani was grounded in the long-running Israeli–Palestinian conflict. From 1968 on, the PLO, Popular Front for the Liberation of Palestine, and other Palestinian groups established a quasi-state in southern Lebanon, using it as a base for raids on civilian targets in northern Israel, as well as worldwide terror attacks on Israeli and other targets. This was exacerbated by an influx of 3,000 PLO militants fleeing a defeat in the Jordanian civil war and regrouping in southern Lebanon. Israel responded with damaging attacks against PLO bases. During Israeli raids from 1968 to 1977, some of the Palestinian towns and camps in the area were totally leveled. According to estimations, by October 1977 about 300,000 refugees, mainly Shiite Muslims, fled South Lebanon. The PLO-Israeli conflict increased political tensions between Maronite Christians and Druze on the one hand and Muslims on the other, adding to the factors behind the 1975–1990 Lebanese Civil War. In November 1977, Israel initiated an exchange of fire that led to the death of several people from both sides of the border and finally Israeli bombing of the targets in South Lebanon during which 70 people, mainly Lebanese, were killed. On March 11, 1978, 11 Fatah members led by the 18-year-old female Dalal Mughrabi travelled from Lebanon and killed an American tourist on the beach. They then hijacked a bus on the Coastal Road near Haifa, and en route to Tel Aviv commandeered a second bus. After a lengthy chase and shootout, 38 Israeli civilians, including 13 children, were killed and 76 wounded. This massacre was the proximate cause of the Israeli invasion three days later. On March 14, 1978, Israel launched Operation Litani, after the Coastal road massacre. The operation was first called "AVI HACHOCHMA" (Father of wisdom), later changed to "Operation Litani". Its stated goals were to push Palestinian militant groups, particularly the PLO, away from the border with Israel, and to bolster Israel's ally at the time, the South Lebanon Army, because of the attacks against Lebanese Christians and Jews and because of the relentless shelling into Northern Israel. The area south of the Litani River, excepting Tyre, was invaded and occupied in a week long offensive. The operation began with air, artillery, and naval bombardment, after which IDF infantry and armor forces, comprising about 25,000 soldiers in total, entered south Lebanon. The Israelis first captured a belt of land approximately 10 kilometers deep, by launching a ground attack on all PLO positions along the Lebanese border with Israel. The ground forces were led by two division commanders, and attacked simultaneously along the entire front. Paratroopers landed from helicopters to capture all the bridges on the Litani River, cutting off the possibility of retreat by the PLO, and later expanded north to the Litani River. The IDF did not succeed in engaging large numbers of PLO forces, who retreated to the north. Many Lebanese civilians were killed by heavy Israeli shelling and air strikes, which also caused extensive property damage and internal displacement. According to Augustus Richard Norton, professor of international relations at Boston University, the IDF military operation killed approximately 1,100 people, most of them Palestinian and Lebanese. According to IDF reporting and internal investigation, at least 550 of the casualties were Palestinian militants initially holding the front line and killed by the IDF ground operation. According to other sources about 2000 Lebanese and Palestinian were killed. Estimates for the number of people displaced by the military operations range from at least 100,000 to 250,000. Syrian troops deployed inside Lebanon, some of which were within visual range of the IDF, but did not take part in the fighting. The PLO retreated north of the Litani River, continuing to fire at the Israelis. The IDF used cluster bombs provided by the United States. According to U.S. President Jimmy Carter, this use of the cluster bombs violated the legal agreement between Israel and the U.S. because the weapons had been provided for defensive purposes against an attack on Israel. Israel also transferred American weapons to Saad Haddad's Lebanese militia, a violation of American law. Carter's administration prepared to notify Congress that American weapons were being used illegally, which would have resulted in military aid to Israel being cut off. The American consul in Jerusalem informed the Israeli government of their plans and, according to Carter, Prime Minister Begin said that the operation was over. In response to the invasion, the UN Security Council passed Resolution 425 and Resolution 426 calling for the withdrawal of Israeli forces from Lebanon were both adopted on March 19, 1978. The UN Interim Force in Lebanon (UNIFIL) was created to enforce this mandate, specifically "for the purpose of confirming the withdrawal of Israeli forces, restoring international peace and security and assisting the Government of Lebanon in ensuring the return of its effective authority in the area". UNIFIL forces arrived in Lebanon on March 23, 1978, setting up headquarters in Naqoura. Resolution 425 didn't result in an immediate end to hostilities. The Israelis continued military operations for 2 more days until they ordered a ceasefire. The PLO's initial reaction was that the resolution didn't apply to them because it didn't mention the PLO. The PLO leadership finally ordered a ceasefire on March 28, 1978, after a meeting between UNIFIL commander General Emmanual Erskine and Yasser Arafat in Beirut. Helena Cobban has described the agreement as "a turning-point in the history of the Palestinian resistance moment" because it was the first open acceptance of a ceasefire agreement with Israel that was endorsed by all official PLO bodies. Parts of the Palestinian resistance movement opposed the agreement and tried to violate the ceasefire. In April 1978, second-level Fatah leader Mohammad Daoud Oudeh (Abu Daoud) organized cells of about 70 to 80 fighters with the intention of breaking the ceasefire. Arafat and Khalil Wazir ordered the arrest of all involved and Abu Daoud was later accused of collaborating with Fatah renegade Abu Nidal to break the ceasefire. Israeli forces withdrew later in 1978, turning over positions inside Lebanon to their ally, the South Lebanon Army (SLA) militia under the leadership of Maj. Saad Haddad. On April 19, 1978, the SLA shelled UNIFIL headquarters, killing 8 UN soldiers. (Fisk, 138). In April 1980, three Irish UN soldiers (Privates Barrett, Smallhorne and O'Mahoney) were kidnapped and two of them murdered by Christian gunmen, Private O'Mahoney survived (being shot by sub-machine gun during the incident) in SLA territory and another Irish soldier Private S. Griffin was shot by Haddad's men, and was medvaced to Israel where he subsequently died during medical treatment. The Israeli press at the time, particularly the Jerusalem Post, accused the Irish of pro-PLO bias. (Fisk, 152–154). Palestinian factions also attacked UNIFIL, kidnapping an Irish UNIFIL soldier in 1981 and continuing to occupy areas in southern Lebanon. Hostilities continued, and as the Lebanese civil war escalated, the fighting intensified in the south again, with a second Israeli invasion in 1982 resulting in a 1982 flare-up that persisted over the next decade. In 2000, the UN Security Council concluded that, as of June 16, 2000, Israel had withdrawn its forces from Lebanon in accordance with Resolution 425. Lebanon has not extended control over south Lebanon, though it was called on to do so by Resolution 1391 of 2002 and urged by Resolution 1496. Israel has lodged multiple complaints regarding Lebanon's conduct. Lebanon's claim that Israel has not fully withdrawn (see Shebaa Farms) was explicitly rejected by the UN's Secretary-General's report which led to Resolution 1583. The Syrian occupation of Lebanon led to UN Security Council Resolution 1559 demanding the remaining 14,000 (of 50,000 originally) Syrian troop withdrawal and the dismantling of Hezbollah and Palestinian militias. On April 26, 2005, after 29 years of Syrian military presence in Lebanon, the last of the Syrian troops withdrew in accordance with the resolution. ^ a b c Augustus Richard Norton; Jillian Schwedler (1993). "(In)security Zones in South Lebanon". Journal of Palestine Studies. University of California Press. 23 (1): 61–79. doi:10.1525/jps.1993.23.1.00p0030t. JSTOR 2537858. ^ a b c Israeli Violations of Human Rights of Lebanese Civilians (PDF). B'Tselem. 2000. pp. 12–13. ^ a b c d Spencer C. Tucker, ed. (2010). The Encyclopedia of Middle East Wars. p. 728. ISBN 978-1-85109-947-4. ^ Grosscup, Beau (1998). The Newest Explosions of Terrorism: Latest Sites of Terrorism in the 1990s and Beyond. New Horizon Press. p. 272. ISBN 9780882821634. ^ Mor, Ben D.; Zeev Moaz (2002). "7". Bound by Struggle: The Strategic Evolution of Enduring International Rivalries. Ann Arbor: University of Michigan Press. p. 192. ISBN 978-0-472-11274-6. ^ Chomsky, Noam (1999). The Fateful Triangle: The United States, Israel, and the Palestinians. Pluto Press. p. 191. ISBN 9780745315300. ^ Israeli Ministry of Foreign Affairs. Statement to the press by Prime Minister Begin on the massacre of Israelis on the Haifa-Tel Aviv Road Archived June 24, 2009, at the Wayback Machine. Historical Documents Archive: March 12, 1978. ^ a b Yaacov Vertzberger (1998). Risk taking and decisionmaking: foreign military intervention decisions. Stanford University Press. p. 328. ISBN 978-0-8047-2747-1. ^ a b c d e f g h i j Helena Cobban (1984). The Palestinian Liberation Organisation: People, Power, and Politics. Cambridge University Press. pp. 95–96. ISBN 978-0-521-27216-2. ^ a b c d Jimmy Carter (1993). The blood of Abraham: insights into the Middle East. University of Arkansas Press. pp. 92–93. ISBN 978-1-55728-862-2. ^ "Extracts relating to Article 98 of the Charter of the United Nations: Supplement No 5 (1970–1978)" (PDF). Repertory of Practice of United Nations Organs. United Nations. p. 69. ^ "Security Council Endorses Secretary-General's Conclusion on Israeli Withdrawal From Lebanon as of 16 June". un.org. Retrieved March 14, 2016. ^ Lancry, Yehuda (April 3, 2002). "A/56/898-S/2002/345 Letter dated 2 April 2002 from the Permanent Representative of Israel to the United Nations addressed to the Secretary-General". United Nations General Assembly. Archived from the original on February 21, 2009. Retrieved March 14, 2016. Fisk, Robert (2002). Pity the Nation: The Abduction of Lebanon. Nation Books. ISBN 978-1-56025-442-3. Shlaim, Avi (2001). The Iron Wall: Israel and the Arab World. W. W. Norton & Company. ISBN 978-0-393-32112-8. Ahmad Beydoun (1992). "The South Lebanon Border Zone: A Local Perspective". Journal of Palestine Studies. University of California Press. 21 (3): 35–53. doi:10.1525/jps.1992.21.3.00p01145. JSTOR 2537518.